Yep, death has a new name and it goes by Death Merchant. Charlie unwittingly becomes one of the secret collectors after the devastating death of his wife. Only Charlie has no idea what a Death Merchant is or why he keeps seeing things glow red, why the shadows seem to be stalking him, or why it seems everyone he meets dies. Left alone to raise his new-born daughter and manage his small business, things only get worse as an average “beta male” Charlie Asher gets deeper and deeper into the bizarreness of his new job of collecting souls. He must contend with vengeful sewer harpies that mock him at every turn and his own ignorance in a race to save the fate of the world and death itself. I give this story four stars only because I felt the “beta male” seemed a little over done about halfway through the book, even still I found the whole premises and execution of the story an incredibly fun read that I couldn’t put down. 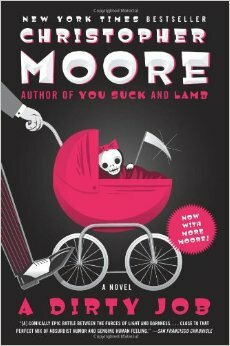 Moore creates a delightful tale as he capitalizes on the mortal coil of the average male. Be prepared to laugh until you cry. And watch out for two hellhounds that eat toasters for breakfast and can burp soap bubbles on command. Because really how cool would it be to have pets like that?